Solar Oven Sun Trackers... The new platform. I was pleased with my first experiment in building a sun tracker for a Sun Oven, but spent way too much time in making the rotating platform. Then I remembered building a platform for my wife many years ago to hold an artificial Christmas tree. Typical tree stands have screws to lock in the orientation and she wanted something that would allow her to spin the tree around while stringing the lights and putting on the decorations. 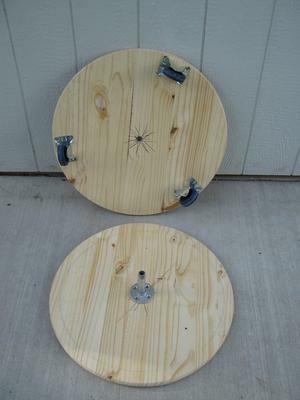 These are 24" circular platforms. 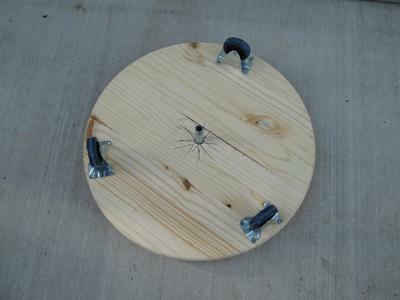 One of the platforms has three 3" wheels and a center hole while the other has a screw in pipe as a guide post. The upper platform can be flipped over onto the lower to save storage space. Currently waiting on a DC motor and a sun tracking board I ordered which should arrive next week. The board is something I've been wanting to experiment with for some time. Yes, I went a bit over on my $50 budget, but I'm hoping to get every thing powered with a 5W solar panel. Happy cooking and bon appetit!